February 11, 2012 February 11, 2012 AliceLeave a Comment on Zara star button waistcoat: did you know? Zara star button waistcoat: did you know? I hope everyone who got to attend a Breaking Dawn DVD release party last night had an amazing time! 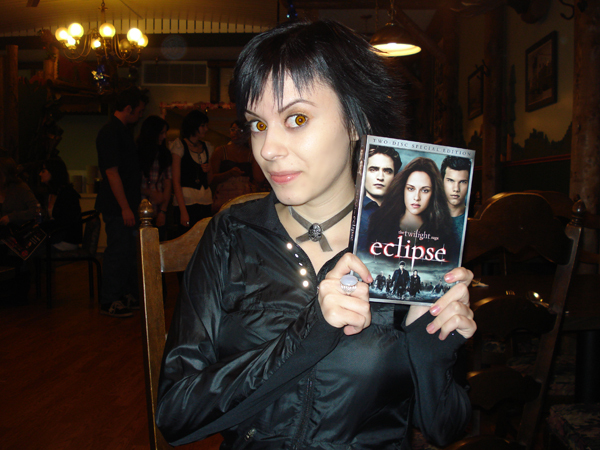 There were no parties that I was aware of in Toronto, but I had fun reminiscing about the amazing few days I spent in Forks for the Eclipse DVD release. I got to meet Christilynn of Inside Bella’s Closet, Staci of Alice’s Closet in Forks, and many, many other amazing people. I can’t wait to go back as the official Alice Cullen of Stephenie Meyer Day 2012! Barring, of course, any work-related obligations. The problem with working in public relations for entertainment is that it can be so hard to get away, especially at the entry level. But I digress – that isn’t actually what this post is about. It’s about the pretty star button waistcoat that Alice wears in New Moon. Even in the darkness of the promotional stills, you can see that the buttons, which feature a star with six points, are what truly make this vest unique. It’s something of a rarity on eBay, and if you find it in the wrong size, don’t despair – reports from girls who own the vest say it runs small (and is more grey than it looks), so it may be safer to get it in one size up. Here’s a clearer picture in order to see the button detailing, courtesy of Coolspotters. A truly rare find, right? Well, maybe not. As Staci and I discovered a few nights ago, Zara made the exact same vest without the star buttons. If you look closely, you can see the the two vests even have the same tag around the inside of the collar, just in case there was any confusion as to whether or not they both came from Zara. The colour of the vest will look different depending on the quality of lighting and the camera the picture is taken with, but as you can see, all of the exact details are present in both vests. 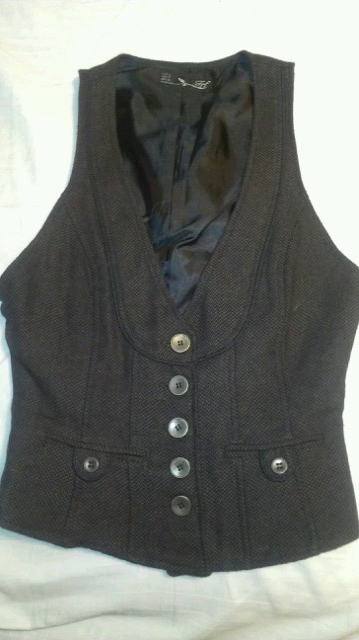 Both vests are tweed and have the same lines and structure to them. So how does this help you? Well, if you’re less picky about details than I am, it means that you can buy the vest without the star buttons and be happy that it looks exactly the same. Truthfully, the buttons are a detail that anyone but you is likely to notice, especially in pictures. But if you are as detail oriented as I am, it’s simple: just replace the buttons. Those six-pointed star buttons do exist comercially, and I know this because I found them at a local button shop in Toronto. When I have both the vest and the buttons, I’ll be replacing the ones the vest came with, and no one will be able to tell the difference. The lesson here? Don’t be afraid to get creative! Finding the exact item you need is always nice, but if you can save yourself a few dollars and lots off hassle on eBay by going this route, give it a try. Next Cosplay. It brings everyone together!